eD@HoMe: 2 awesome covers from the Middle East! Good day! Just a quick posting. For today, I have two lovely covers from the Middle East to share with you. Another of my amazing covers bought on the eBay! 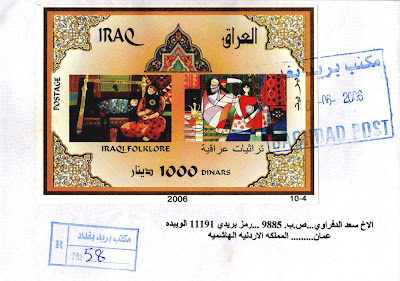 This awesome registered cover was franked by a miniature sheet from the "Iraqi Folklore" series. 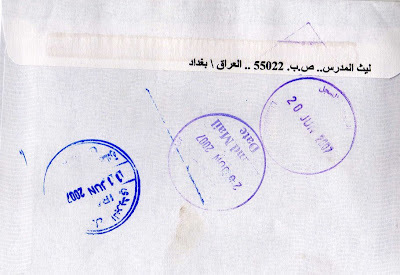 It was sent from Baghdad, Iraq to Jordan on 10 June 2006. 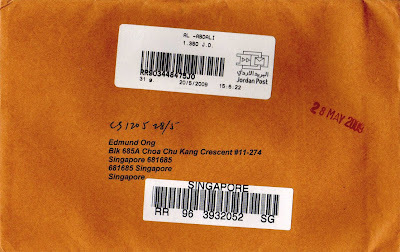 The second cover was sent from Al Abdali, Jordan to Singapore. It is my first from Jordan! This cover was posted on 20 May 2009 and took 8 days to travel an estimated distance of 7,805kms to reach me. That's all I have for today. See you again!